When? The last day of February every year. What? 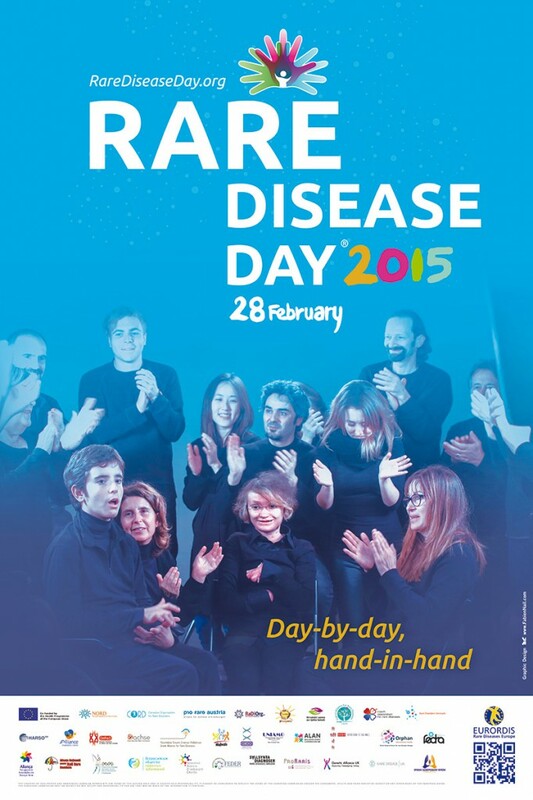 Rare Disease Day is to raise awareness for rare diseases and their impact on the lives of patients and families. Where? Thousands of events around the world! EURORDIS organises the international campaign and National Alliances and other rare disease patient organisations hold events locally. Who? For everyone! The Rare Disease Day campaign targets the general public and policy makers and anyone is welcome to join: patients and their families, patients organisations, health professionals, researchers drug developers, public health authorities – the more, the better! How? Since the Rare Disease Day was created by EURORDIS in 2008, thousands of awareness – raising activities have taken place throughout the world reaching hundreds of thousands of people and generating local and international media attention. On rarediseaseday.org you can find information about the thousands of events happening around the world to build awareness for people living with a rare disease and their families. Next Annual General Meeting will take place in Cologne, Germany from Friday October 16th to Saturday October 17th , 2015 . Erwan Le Roux winner of the Multi50 category onboard FenêtréA-Cardinal. On the photograph, quite in evidence, the logo of the European Federation of Associations of Patients with Haemochromatosis-EFAPH. The European and French Haemochromatosis Federations as well as the associated regions/countries hail Erwan’s victory and congratulate him wholeheartedly. Hundreds of thousands of onlookers converged in Saint Malo (French Brittany) to watch the departure of the 10th. Route du Rhum. 91 standalone skippers sailed off on November 2 to reach Point-à-Pitre (French Bermudas). 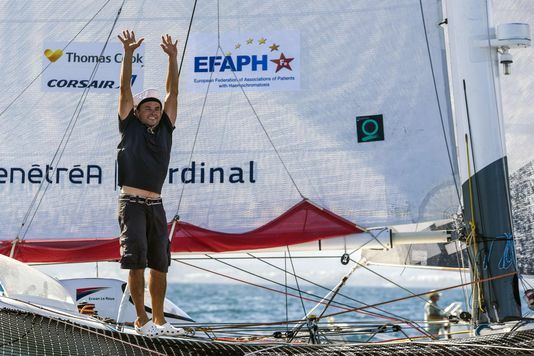 This year AHO and FFAMH, members of the European Federation of Associations of Patients with Haemochromatosis (EFAPH) are closely following this remarkable sport event: skipper Erwan Le Roux sailed off onboard his trimaran FenêtréA-Cardinal, displaying the EFAPH logo on its main sail. This partnership was initiated when Françoise Courtois, EFAPH Secretary General, met Erwan Le Roux in October on occasion of the ProAm Sail and Golf taking place at Cissé-Blossac (French Brittany). Erwan had spontaneously volunteered to support EFAPH in the latter’s efforts to publicize haemochromatosis. Let us follow proudly Erwan’s endeavor and support him until he reaches Point-à-Pitre! Am 17. Februar wurde der Verein “Hämochromatose Schweiz” gegründet. Wir gratulieren der Vorsitzenden Gerda Horn und Ihren Mitstreitern. For more information visit www.haemochromatose.be. The second EFAPH Newsletter is available. HEMO o NEWS 2 is ready for download in an English and French version. Le samedi 23 novembre 2013 Madame Dr. Françoise Courtois, Secrétaire Générale de la Fédération Européenne des Associations de Malades de l’Hémochromatose EFAPH a reçu l’insigne de Chevalier dans l’ordre national de la Légion d’honneur au Château du Val. Féliciations! EFAPH is delighted to present its work, projects and requests at a lunch-deabte in the EU Parliament on Sept. 20th 2011. Agenda (Download). EFAPH heißt die Schweizer Hämochromatose-Selbsthilfegruppe als neues Mitglied herzlich willkommen! EFAPH cordially welcomes the new member from Switzerland !